Cigars come in a variety of shapes and sizes, which are often referred to as Vitolas. Each of the different formats offering varying smoking experiences from the fullness to the overall burning time. Furthermore, the various cigar formats are often very differently priced, which can make it confusing when choosing your first cigar. Therefore, it’s helpful to know the different sizes and shapes before you start making purchases or building out your collection. Similarly, the cigar industry is rife with different terms and expressions. However, we have identified the most standardised and universally-recognised terms. In this definitive guide, you will learn about the different types of cigar that you can buy. Learning about cigars can be a confusing and overwhelming endeavour. With a plethora of colourful Spanish terminology, it’s often like learning a new language! Furthermore, the industry is far from standard so you’ll regularly come across different terms that are synonymous. Fortunately, this guide will cut through all the confusion for a definitive guide of cigar types and vitolas. A great guide to learn about cigar vitolas. This well-written breakdown makes it easy to understand! Cigar Types Guide Reviewed by Philippe Jolivet on January 19th . 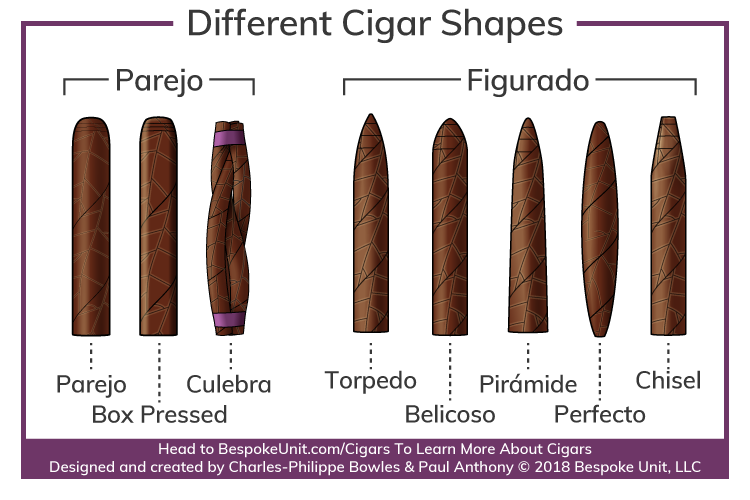 What Are The Different Cigar Shapes? 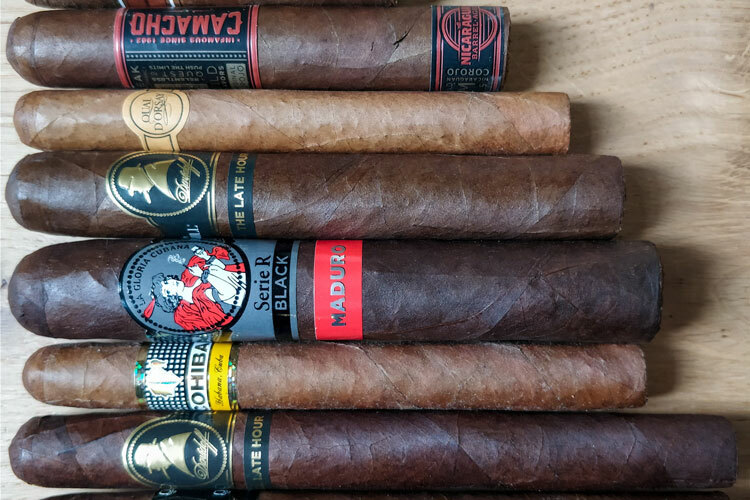 Cigars come in all sorts of shapes and sizes, which can easily get confusing. Moreover, there are many synonyms and conflicting terms used by different circles. For instance, the Cubans may call a particular type of cigar a Prominente whilst the American market will refer to it as a Double Corona. Even worse, the industry hasn’t standardised any of the shapes, sizes and their measurements. In fact, various brands interpret these in their own way. Although it can be frustrating, you could also see it as just another adventure! Fortunately, after much research and the combined experienced of the Bespoke Unit team, we’ve broken down the terminology in order to determine the most common and recognised terms and sizes. What’s The Difference Between A Parejo & A Figurado? The initial fundamental to learn about distinguishing cigars is knowing the difference between a Figurado and a Parejo. 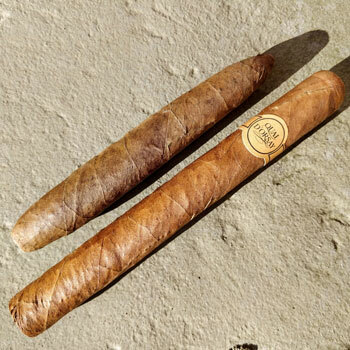 Firstly, a Parejo is the classic cigar shape, which means “flush” or “straight” in Spanish. As this suggestes, it’s straight with one rounded capped end called the head and a flat open end known as the foot. Additionally, Parejo can be almost any size, which we’ll explore further on. Anything that isn’t a Parejo is simply referred to as a Figurado. This means that the shape doesn’t follow the conventional straightness and may alter in thickness at some point. Sometimes the word “Torpedo” is thrown around instead of Firagurado. However, this is a specific shape rather than a family of shapes as you’ll learn a little further down. What Are The Varieties Of Different Parejo Cigars? As a general rule, Parejos are a specific format of cigar in themselves. These are in fact the most common shape that you can find that are straight with a slightly domed head and flat head. Nevertheless, sometimes Parejos can be delivered in different formats or feature various finishes. A typical alternative is the box-pressed cigar, which has a square-shaped finish. Although first frowned upon, box-pressed cigars have garnered quite the following. Box-pressed cigars were originally introduced as a way of saving money. Instead of spacing out normal Parejo cigars in a box, they were pressed and crammed into a smaller one so more could be transported. As a result, the cigars developed a square shape under the pressure. However, by being tightly packed, the cigars would actually burn longer and provide a consistent flavour. What Is A Culebra Cigar? Meanwhile, an exotic form of Parejos is the Culebra. Meaning “snake” in Spanish, these oddities have existed since the late 19th Century. They are achieved by effectively braiding three Panatela Purejos together. Although something of a novelty, the manufacturing process isn’t simple. In order to make a culebra, the roller must be sure that the tobacco is moistened more than usual to prevent them breaking under the pressure. Once finished, a single band wrapped the three cigars as well as a ribbon on each end. Sometimes, the three cigars will share a single cap on both the head and the foot. Rather than smoking all three at once, they can be separated and traditionally shared among friends. If you’re part of a terrible trio of pals, they’re an ideal way to spend a moment together. However, if you’re feeling brave, it is possible to smoke them as a single cigar! 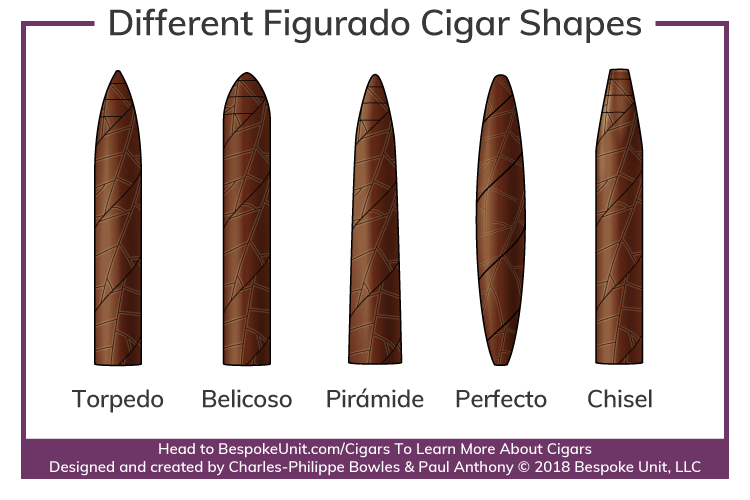 What Are The Different Types Of Figurado Cigars? As you may have noticed, there isn’t a single type of Figurado cigar. In fact, there are many ways in which a Figurado can be shaped. As mentioned above, the term itself refers to any type of cigar that doesn’t feature the more classic Parejo shape. You can use their links to jump straight to them or scroll down to learn about each one. Sometimes used as a term to refer to all Figurado cigars, Torpedoes have their own specific shape. Typically, they feature a sloping and tapered head that curves into a point. Often mistaken for Torpedoes, Belicoso cigars can be differentiated by their sharper taper. Named because of its resemblance to a bullet, Belicosos are something of a hybrid between Torpedoes and Parejos. 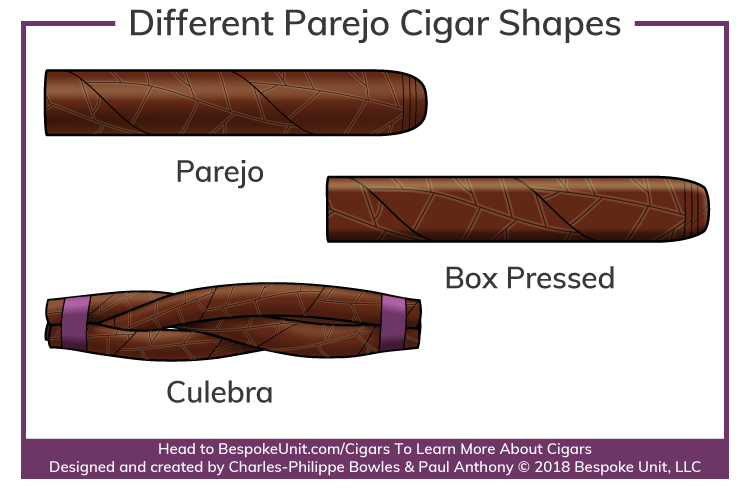 Instead of featuring the domed head of a Parejo, a Belicoso has a slight point, which makes it possible to customise the draw. Usually referred to as “Pyramids” in English, Pirámide are tapered all the way down the body. This makes them thicker at the foot than at the base of the head. Otherwise, they feature a cap very similar to a Torpedo. An entire family within itself, Perfecto cigars have their own variations. Generally, a Perfecto cigar has two tapered ends on both the head and foot. In Cuba, they’re typically referred to as either Exquisito or Double Figurado cigars. Sometimes both are capped with flag leaf. However, the foot may be open with a bump at the end. Alternatively, they can appear to be relatively symmetrical with the same pointed shape on each end. 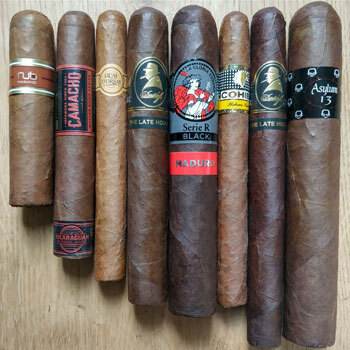 What Are The Different Cigar Sizes? 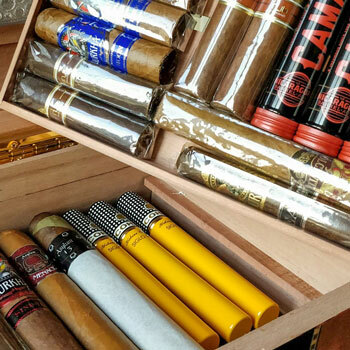 Although cigars can be limited in shape, there are many different types of sizes that can be found. Whilst some of short and thick, others can be long and thin. Furthermore, it’s at this point that cigar vitolas can get confusing as the terms are rarely standardised. For instance, there are traditional Cuban sizes that are becoming quite rare. Meanwhile, the American market for New World cigars has began borrowing a few terms as well as making their own. Furthermore, many of the named sizes are usually employed as general rules of thumbs. They can often differ between manufacturers by as much as an inch and sometimes more. In this guide, we’ll combine the two whilst sticking to the most commonly recognised sizes. Although the metric system has been compulsory in Cuba since 1858, cigars are usually measured in inches. Whilst some countries employ the metric system, it’s almost an industry norm to use imperial measurements. This is likely because of the United States’ influence in the market. Overall, cigars are measured according their length and ring gauge. The length is simply measured in inches such as a Corona, which is usually 5.25″ long. Meanwhile, the ring gauge is the cigar’s diameter. Because a ring gauge is often quite small, it’s measured by 64ths of an inch rather than a decimal. This fraction is then simplified by simply giving the resulting figure. For instance, a typical Corona is 0.68 inches thick, which comes to 44/64, is presented as simply 44. Therefore, when giving its overall dimensions, a Corona will be presented as 5.25×44. In other countries that focus on the metric system, this information is often presented in either centimetres or millimetres for the length and gauge. We’ll offer these alternative measurements in the chart below. As cigar size names can greatly fluctuate between different brands, it can sometimes be too conceptual to understand. Using this as a more precise scale can sometimes make it easier when trying to visualise the size of a cigar. 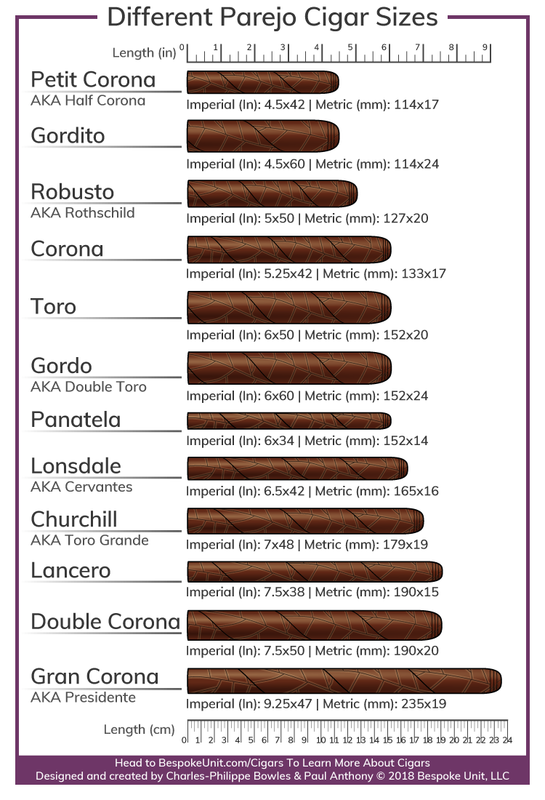 Using the chart below, you’ll be able to easily visualise the difference between each of the cigar sizes. Whilst the sizes below don’t reflect real life, they are to scale with one another to make it easier to compare. As you may have noticed, we haven’t included any Figurados in the above list. We’ll explain this is greater detail a little further down. For now, we’ll explore the general sizes between different cigars. Note that the dimensions provided are generalisations and may fluctuate between different brands by as much as an inch. 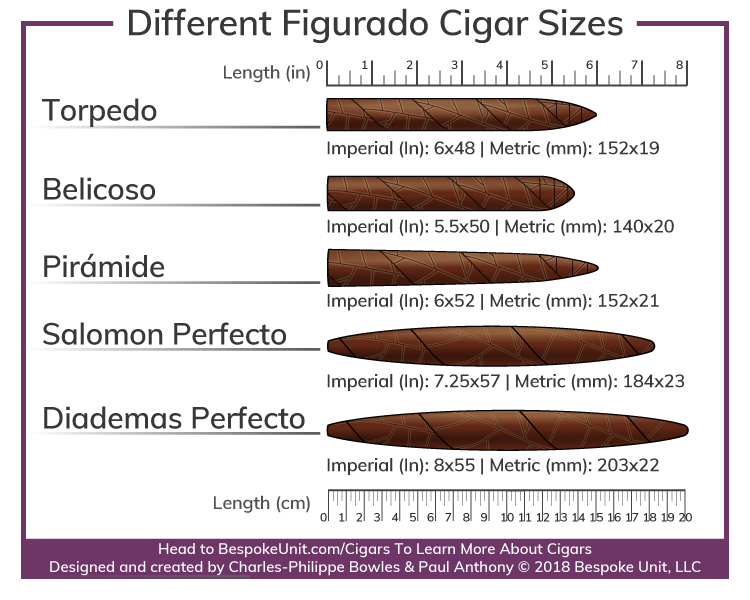 To learn a bit more about each cigar size, either scroll down or click on one above to jump straight to it! Based on the standard Corona size, the Petit Corona is prefixed with the French for “small”. However, sometimes it is referred to as a “Half Corona” instead or “Mareva” in Cuba. Although a diminutive cigar, it’s not the smallest that you can buy. However, it is one of the smallest handmade sizes available. Usually, smaller cigars have to be machine made as a roller won’t be able to successfully roll such tiny amounts of tobacco. In recent years, Petit Coronas have waned in popularity in favour of the newer Robusto format. However, they’re an excellent choice when either on a budget or looking for a relatively quick 30-minute smoke. Gorditos are something of a newer phenomenon that have been popularised by brands such as Oliva with their Nub range. These short and fat cigars are enjoyed for their thick ring gauge, which offers a full yet short smoke. 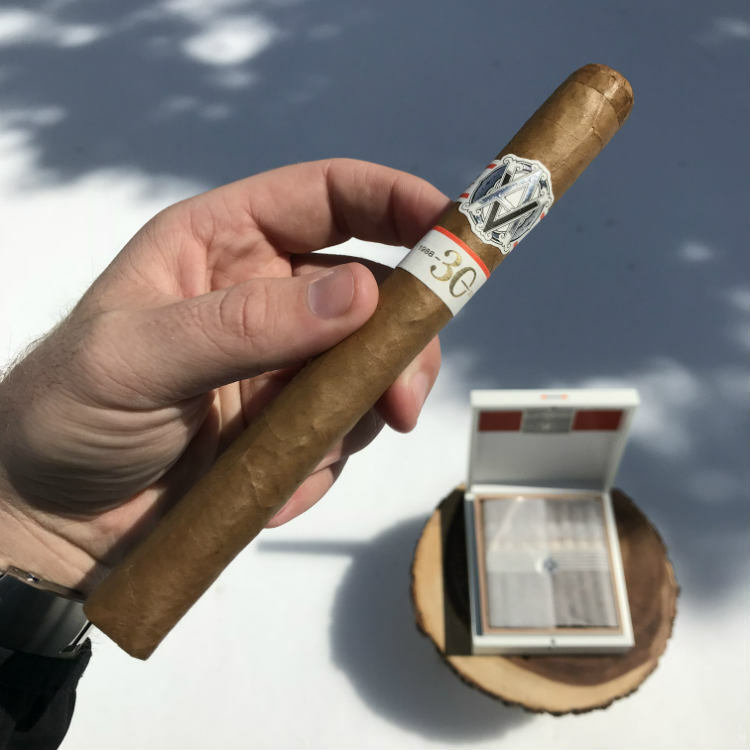 For those who enjoy is a cigar with lots of smoke yet don’t have the time to work through the larger vitolas, a Gordito is a fantastic choice. Usually, these are rather inexpensive compared to larger formats. However, they tend to be reserved for the New World market. Whilst some Cuban brands have begun to make their own take on the Gordito format, they tend to remain closer to Rothschilds and Robustos. Like the Gordito, the Robusto is a somewhat newer format but still older than its chunkier cousin. Nevertheless, Robustos are continuing to grow in popularity and have slowly replaced Coronas as the standard cigar size in the USA. A very similar vitola in Cuba is the Rothschild, which is a 4.5×48 cigar that was named after a 19th-Century German banker. With their average length, they produce a smoke that’s similar to a Corona. However, with their larger ring gauge, they offer a fuller smoke, which many contemporary cigar enthusiasts tend to prefer. However, note that there isn’t any direct correlation between a cigar’s fullness and its ring gauge. This depends largely on the type of tobacco used. Nevertheless, larger ring gauges tend to be cooler and produce more smoke. Despite being less popular than Robustos, the Corona is still the benchmark size for the cigar industry. It’s considered the average and something of the entry point when accessing truly premium cigars. Whilst the length is often a touch over 5 inches, the ring gauge tends to oscillate between 42 and 46. Its slightly smaller ring gauge means that it may burn hotter than a Robusto with a lighter build-up of smoke. Also known as the Corona Gorda, a Toro is another newer size that offers an experience similar to the Robusto. However, the extra inch can make all the difference and provide more than an hour’s smoke. Traditionally, Toros are slightly smaller at around 5 5/8 x 46. However, because of this similarity to the Robusto, many firms have begun rounding up to 6×50. The Gordito’s older cousin, the Gordo is a chunky cigar. Its name essentially means “fat” in Spanish. They’re usually of a similar length than a Toro but offer an extra ring gauge for a cooler and smokier experience. Sometimes, the term “Gordo” will be used to refer to any cigar with a large ring gauge and can be applied to anything above 60. For instance, there are large Gordo cigars such as the JFR Lunatic or Asylum 13 that are 8×80! Whilst the same length as a Gordo, the Panatela is something of its antithesis. However, it is a far older format that has been around for centuries. Originally the aristocrat’s choice, the popularity of the Panatela waned during the 20th Century. It gained something of a resurgence when marketed as the cigar most suitable for women yet this renaissance was short-lived. Although Panatelas can still easily be found among Cuban manufacturers, they’re now rather niche compared to thicker cigars. Traditionally known as the Cervante, the Lonsdale was named after an English lord who had a line of this format manufactured in his name. It is often associated with the Cuban house, Rafael Gonzalez, who would have his portrait inside their boxes. Like Panatelas, Lonsdales are a more Cuban format that tend to come with aristocratic connotations. However, they’re generally overshadowed by both Gordos and the more prominent Churchill vitola. Named after the world’s most famous cigar enthusiast, Churchills are very long cigars with a more conventional gauge. Romeo y Julieta claimed that he was particularly fond of the Julieta No. 2 so they renamed it after the former British Prime Minister a few years after his passing. In short, the Churchill is an inch longer than a Toro in order to provide the smoker a more complex experience. Usually, a quality cigar will evolve in flavour as it burns because the smoke and oil drawn through will influence the tobacco lower down. Given that there is a fair amount of wiggle room in this format, you may well stumble upon other very similar sizes. For instance, the Toro Grande is much like the Churchill in length except that the gauge can be around 52. Essentially an inch-longer Panatela, Lanceros are a rare breed. These refined cigars also feature a very slightly larger ring gauge in order to support the extra length. Nevertheless, Lanceros are experiencing a minor renaissance with a fervent following. If you ever have the opportunity, they’re a unique cigar that offer an evolution in flavours similar to the Churchill. Although the Churchill carries his namesake, this vitola was said to be the British PM’s favourite. Although not strictly twice the size of a corona, they’re somewhat larger and offer a full experience. Double Coronas may take several hours to smoke but you can experience the aromas’ evolution and complexities to a greater degree than a smaller cigar. They are also sometimes referred to as Prominentes in Cuba. You may occasionally also come across Gran Corona cigars. These tend to be anything larger than the Double Corona vitolas with over 9 inches of length and a ring gauge of just under 50. Also sometimes lovingly referred to as “Presidente” cigars, Gran Coronas are overly long variants of the Double Corona. However, they don’t have a particularly thick ring gauge unlike various Gordo vitolas. If you have a number of hours to kill, you may enjoy one of these. However, be warned that some circles may not take you seriously! Although most Figurado cigars will follow the same general sizing formats as Parejos, there are a couple of exceptions. Usually, a Figurado cigar will compound several names to make it identifiable. For instance, Camacho have created Perfecto Gordo vitolas of their American Barrel-Aged cigars. Nevertheless, sometimes Figurado cigars will omit the accompanying size in the name entirely. This is because it may already be implied by the shape as illustrated by the graphic below. Not that the measurements listed are indeed averages. Compared to the Parejo sizes, there’s much more leeway. Generally, Belicoso cigars are comparable to Robustos if the size isn’t specified. In fact, you could even consider that extra half-inch to be simply the sloping head. Overall, Belicoso are smaller cigars. Nevertheless, you can occasionally come across Belicoso Gordos as well. If Belicosos can be compared to Robustos, then Topredoes are the Toro of Figurados. In fact, Torpedoes tend to be a size among themselves, which usually comes to about 6″ of length and just under 50 ring gauge. Remember that when cutting a Figurado, you’ll often lose a fair amount of the total length. Therefore, the final size of the cigar could be closer to a Corona! Usually, Pirámede cigars are a very similar size to Torpedoes. Their biggest difference is the thicker ring gauge at the foot, which can slope down to much less nearer the head. Although Perfectos tend to vary in size more than other vitolas, they have a few of their own unique sizes. One of the most common of these is the Salómon, which is over 7 inches in length with a sturdy 57 gauge. Smaller Perfectos tend to curve more than the Salómon. However, these may feature a slight tapering like a Pirámede down their body, which will reduce the gauge as you smoke. The other peculiar size unique to Perfectos is the Diademas, an 8-inch long beast with a modest 55 ring gauge. As you may expect, these are quite rare to come by. However, they’re quite eye-catching. Like the Salómon, they’re large cigars. However, while they are longer, they’re also somewhat thinner. Unlike smaller Perfectos, the majority of their body is flat and the cigar doesn’t curve quite as much. I really want to try a Gordito. Any advice? Oliva’s Nub range is always a solid choice (reviews coming soon). Otherwise, we’re quite fond of the Gukrha Typhoon.